Unfortunately, due to various circumstances and problems, it was decided that the FlightGear v3.6 release would be skipped (see FlightGear Newsletter November 2015), and that the development focus would shift to the FlightGear v3.8 release. In addition, through debates raised by the delays leading up to the cancellation, it was decided to pursue the automation of the release cycle through the use of scripts in the FlightGear build server. 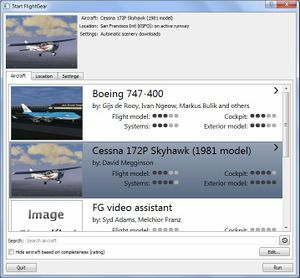 Although not a true, official version, FlightGear v3.6 Release Candidate contains many exciting new features, enhancements and bug fixes. Highlights include a reduced base installation size, a new integrated Qt-based launcher, improvements to the built-in web UI, cockpit shadows without Rembrandt, and massive improvements to the Cessna 172P. If users want to download the 3.6 Release Candidate (which may be unstable), they can do so here. The base package has been reduced in size to 1.3 GB and moved to http://sourceforge.net/p/flightgear/fgdata/. All aircraft except the Cessna 172P and UFO have been removed. All core repositories have been moved to SourceForge. They can be found at https://sourceforge.net/projects/flightgear/. Interactive traffic system re-enabled, having been disabled by mistake some releases previously. Various security improvements, including the disabling of system.fgfsrc. The aircraft page of the Qt launcher for FlightGear 3.5 as rendered on Windows 7. The built-in Qt launcher is available for all of FlightGear's supported operating systems. Tooltips can now be positioned at a specific place on-screen. wing flex module added, controllable via Nasal or Property Rules. Bug-fixes and improvements to the Failure Manager. <variant-of> tag in the *-set.xml file has been added. See FlightGear Newsletter March 2015. Automatic checklist execution, which can, for example, be used for autostart. 8.33 kHz spacing is now supported on comms radios. Sync with the latest version of JSBSim. The pitot angle can now be tweaked with the <pitot_angle> tag in the <metrics> block. The refuel rate is now configurable with the <refuel-rate> tag in the <propulsion> block. The addition of 3D grass to the random vegetation system. Interior glass reflections, frosting and fogging. New thruster effect (can be used for afterburners flames, rockets, etc.). Many improvements to Phi, the built-in web interface. GUI cleanup to improve support for multiple GUI styles. Regional texture definitions for Florida, Brazil, Latin America, Africa, the Middle East and Southeastern Asia. stgmerge tool added to merge objects in a scenery tile into a smaller number of meshes. Complete refresh of the default Cessna 172P, including engine options, various tire sizes and floats. Major enhancements to the Space Shuttle. The Shuttle can be flown as per the Crew Operations Manual from launch to touchdown. Update the World Magnetic Model to version 2015.0. ↑ Torsten Dreyer (Nov 30th, 2015). Re: [Flightgear-devel] Fate of 3.6 and features for 3.8. This page was last modified on 27 November 2016, at 06:28.